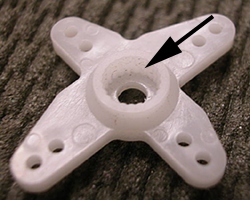 Take care when pressing the plastic output arm onto a metal output shaft of a servo. If the mating splines are not properly aligned, the splines in the servo output arm can sustain damage. The symptoms of damaged splines can appear similar to those of stripped servo gears. So, if you change a servo due to suspected stripped gears, utilize a fresh servo arm as well. And, should your model experience a control surface flutter (and is still in one piece), reduce power and ease the nose up to reduce speed. Check for controllability and land ASAP. Do not fly the model again until the cause of the flutter is determined and eliminated for certain. NOTE: BVM uses JR plastic arms for 90% of our high performance jet applications.